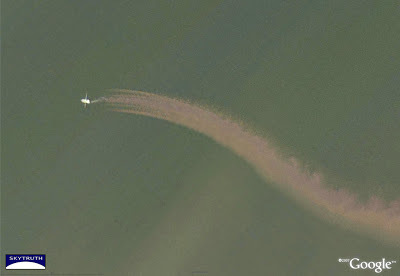 BP / Gulf Oil Spill – Are Shrimpers Inadvertently Churning Up Oil? Oil or algae? Photo of West Bay, Louisiana taken October 22. Source: Matthew Hinton via the Times-Picayune. Photo gallery here. At SkyTruth we’re concerned that fishing activity could potentially stir up any oil that’s sitting on the seafloor, resuspending it in the water column. We don’t know if that’s what has happened near Southwest Pass. 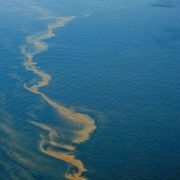 But we do know that bottom-trawling for shrimp in the Gulf routinely churns up the muddy seafloor, creating long sediment-laden plumes that trail for miles behind the trawlers and can be seen on satellite images. Check out our gallery of trawling images, and read more about it on this blog. Google Earth image showing muddy plume of sediment raised by a shrimp trawler at work along the Louisiana coast. Image taken before the BP spill. 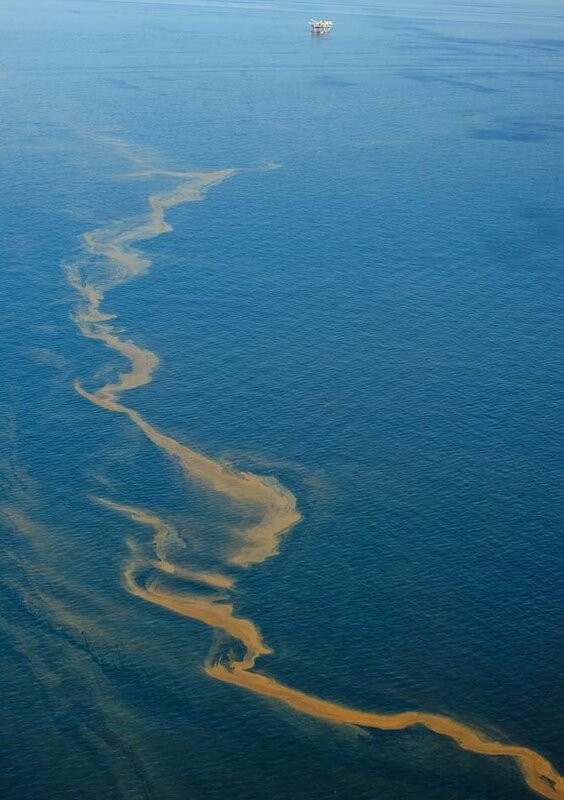 NOAA reports they haven’t yet found any signs of oil sitting on the Gulf seafloor. Other scientists claim they found inches-thick layers of oil on the seafloor on research cruises in September and “vast amounts” of oil on the seafloor in October. It seems reasonable to assume that if those scientists are correct, and if bottom-trawling for shrimp is occurring now in places where layers of oil are sitting on the seafloor, that oil will be disturbed by trawling. We don’t know what the effects of that could be. It might help the oil biodegrade more quickly. But it will also repeatedly expose marine life, including commercially important species, to oil that would otherwise remain on the ocean floor. This suggests to us that it’s very important to quickly, accurately and thoroughly survey the Gulf seafloor for residual oil, so we can let shrimpers know what areas to avoid for now. 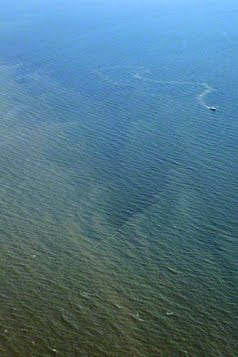 Shrimp trawler working in mysterious substance floating in West Bay, Louisiana on October 23. Note plume behind the trawler. Source: Erika Blumenfeld via Trouthout. https://skytruth.org/wp-content/uploads/2010/10/oil_times-picayune.jpg 400 282 John Amos /wp-content/uploads/2016/08/test_logo.png John Amos2010-10-28 12:33:002019-02-27 15:58:48BP / Gulf Oil Spill - Are Shrimpers Inadvertently Churning Up Oil? From our remote satellite perspective here at SkyTruth, most of the observable impacts from the BP / Deepwater Horizon oil spill in the Gulf of Mexico were dissipating in late July, in the wake of Tropical Storm Bonnie. We live on Navarre beach Florida. While walking along the Santa Rosa Sounds yesterday 10.14.2010, I say many, many tar balls that had washed up on the beach of the Sound. There were still others attached to the sea weed still in the water. News accounts have provided cause for optimism, including good numbers of some fish species and birds in the area, but also note that oil continues to persist in a variety of environments. And for other economically and biologically important species, such as bluefin tuna, it may take some time for spill-related problems to manifest themselves. 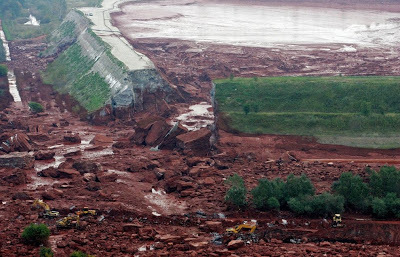 A massive spill of 184 million gallons of red, caustic, toxic sludge occurred on October 4 when a waste impoundment failed at an alumina processing facility near the city of Ajka in Hungary. Nine people have died, dozens were injured, and many were displaced when the red tide swept through several towns. 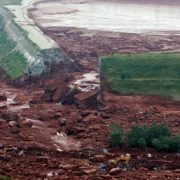 On October 7 the spill reportedly reached the Danube River. 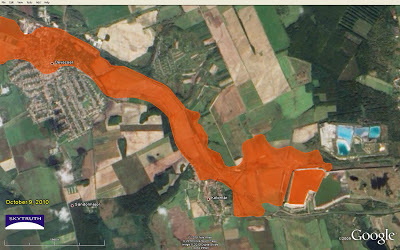 Satellite image taken October 9, 2010, showing extent of sludge spill (SkyTruth analysis). We’ve created a small gallery of images showing the area before, and after, the spill occurred. We used 2004 imagery in Google Earth for the “before” shot; and NASA provided us with an ALI image from the EO-1 satellite, taken on October 9, for the “after” image. We analyzed that image and delineated areas directly impacted by the spill in orange (roughly the same color as the actual sludge…). Visit the SkyTruth gallery. Thanks to Jesse Allen and the NASA EO-1 team for providing the October 9 image. You can get it here. Early-bird registration for NCSE‘s 11th annual conference on science, policy and the environment closes Friday, so hurry up to get that discount: this year’s theme is Our Changing Oceans, and it features a full day of sessions on the BP / Deepwater Horizon oil spill – its impacts, what we can do to improve drilling safety and reduce the risks, what we should do to restore the Gulf. I’m honored to be serving on the advisory committee and can promise we have an impressive slate of speakers lined up for the plenary sessions. Hope to see you there! 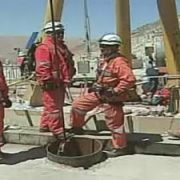 Chilean Miners – Rescue Underway! 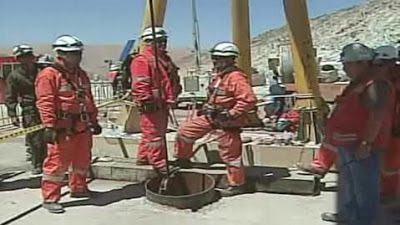 The 33 gold miners in Chile who have been trapped underground for more than 2 months are being rescued, right now. Watch live coverage of this joyful event. It’s good to see a happy ending this time. https://skytruth.org/wp-content/uploads/2010/10/SkyTruth-Chilean-miner-rescue.jpg 225 400 John Amos /wp-content/uploads/2016/08/test_logo.png John Amos2010-10-13 15:02:002019-02-27 16:00:27Chilean Miners - Rescue Underway!